It’s just synchronicity that I happened to read another book about Stalinist repression straight after Katherine Brabon’s The Memory Artist. The latter arrived courtesy of Allen and Unwin after Brabon won the Vogel while The Noise of Time just happened to be on the New Books shelf at the library this week. I knew nothing about it except the author’s name, and that was enough for me, I didn’t even read the blurb before taking it home. The Noise of Time starts with the chilling image of Shostakovich (1906-1975) standing beside the lift in his apartment block, waiting for the KGB to arrest him. To avoid the indignity of being arrested in his pyjamas, and to spare his wife and children the horror of it, he is waiting fully dressed for the inevitable, knowing that it is more than possible that this could be his last day on earth. He expects to be exiled to a Siberian labour camp, or to be shot. “Muddle instead of music”, Pravda 28/1/36, a critique of Lady Macbeth of Mtsensk. Source: Wikipedia. The novel then backtracks to the day he offended Stalin with his opera Lady Macbeth of the Mtsensk and the subsequent denunciation in Pravda (the official Soviet newspaper). When he is subsequently interrogated by Zavrevsky, he is told that he has been denounced for something that both and his interrogator know he never said or did, but still, he is given forty-eight hours to ‘remember’ every detail of all the discussions regarding the plot against Comrade Stalin. But in an inexplicable reversal of fortune, Zavrevsky himself is arrested and Shostakovich is reprieved. From then on the story traces the compromises he thereafter had to make in order to be able to continue composing. There is mention of the great Leningrad Symphony composed during the Nazi siege of the city (an event which forms the basis of Sarah Quigley’s novel The Conductor – see my review) but the focus of the novel is mainly on the emotional and creative cost of Stalin’s Terror on an artist. Shostakovich was never tempted by a life abroad. He was a Russian composer who lived in Russia. He loved his country and his music is still much loved by the Russian people. (His Waltz No 2 was featured in the Kostroma Dance Company’s performance we saw in Moscow in 2012 and all around us the audience was swaying to the music – they obviously knew it well.) 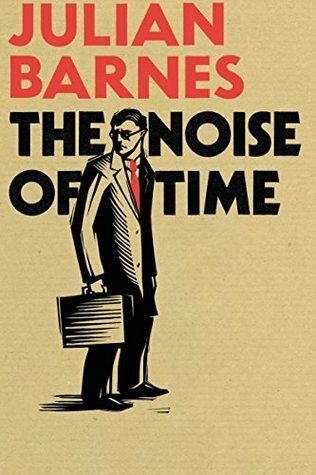 But Stalin’s intervention meant that Shostakovich never dared compose the operas he thought he was capable of, and Barnes’ story shows how relentlessly he was subdued under the Soviet regime. It took courage just to refuse to join the party, but there was a creative price to be paid, and even then there were no guarantees. Like anyone else who had ever come to Stalin’s attention, Shostakovich lived his life in full awareness that he was always on borrowed time. And he was in no position to do anything heroic: in Stalin’s Russia there were only two types of composer: those who were alive and frightened; and those who were dead. He admired those who stood up and spoke truth to Power. He admired their bravery and their moral integrity. And sometimes he envied them: but it was complicated, because part of what he envied them was their death, their being put out of the agony of living. As he had stood waiting for the lift doors to open on the fifth floor of the Bolshaya Pushkarskaya Street, terror was mixed with the pulsing desire to be taken away. He too had felt the vanity of transitory courage. It is so easy to forget, here in the complacency of democratic Australia, that these dilemmas are still being confronted every day, in countries from one side of the globe to the other. Almost every week my file of letters for PEN grows, with letters to tyrants and dictators in Africa, Asia, South America, Southeast Asia, and the Middle East. People who do the same work for Amnesty International know the dispiriting feeling too. When we listen to Shostakovich’s music, we can only hope that his kind of tenacity might yet sustain victims of terror today. For a different perspective on this book, see Some Rambling Thoughts at Russia Reviewed. I stumbled on this interesting doco while sourcing links for this post. You might find it interesting too. I am not a communist, I don’t believe the centralization of power ever works. But there was a time when people in the West believed that a workers state, however imperfect, had been created in Russia, and that it deserved the support of all who counted themselves on the left. Capitalists and their apologists were of course terrified, and now of course are only too happy that Stalin proved them right. I’m not a political theorist, but it’s seems to me that any analysis of communism (including its contemporary manifestations e,g, in Vietnam, Cuba) ought to separate the theory from the dictators who did such dreadful things in its name. The other awkward truth is that we in the west owe our freedom to Stalin and to the centralised power that he had. If he hadn’t been able to mobilise his forces as he did, there would not have been that decisive victory against Hitler, and the Nazis would have taken Europe. (Can you imagine the existing rabble fighting off a resurgent Germany now??) The US and its lesser acolytes (i.e. us) would have had to accommodate the Nazis as they now ‘accommodate’ evil regimes in the Middle East. The world would have been a truly horrible place. Thank you for yet another well-written, inspiring review Lisa – you always place books like these in context – wish you were around when I did my HSC:) At high school, I read Arthur Koestler’s Darkness At Noon along a similar vein and have never forgotten it. What stayed in my mind was the ethical questions, the choices we make – he focused on how easy it is to turn a blind eye to injustice and even become one of the oppressors or commit actions you never thought you could. His characterisation made the historical setting and the ‘big’ picture gut wrenching. I recommended Koestler’s novel to a new student who has come from Turkey where she published short stories but it is no longer safe for her to write and where some of her friends have been sent to prison. However, she still wants to have social justice issues underpinning her creative writing and of course wants write them in English now she is living here. I’ll point her in the direction of your reviews! I read Solzhenitsyn’s The Gulag Archipelago first year at university and I remember having an all night debate/discussion with an uncle when I returned to Scotland for a holiday. He was a traditional card-carrying communist from the depression era and I had a victory of sorts when he promised to read the book! I remember reading Koestler too – and Solzhenitsyn – and looking back on it I think how interesting it was that these two were choices for senior school students: they certainly fitted the anti-communist narrative that ironically kept one party in power here for 25 years! (I’m not implying that they weren’t valid, only that they were politically convenient in reinforcing something that Australian teenagers probably wouldn’t have taken much notice of). Your new student has a rich palette to choose from, your challenge is going to be persuading her to leave some issues for her next book! I heard a discussion of this book recently and was intrigued, particularly having read Emma Ayres’ Cadence and her very moving discussion of Shostakovich. What a challenging life he had. I’ve got Cadence, I must read it soon, it belongs to a friend and must give it back!